We wrap up our look at Chatty's best card combinations for Hearthstone: Curse of Naxxramas with some simple combos and... Thaddius. Hearthstone's 'Curse of Naxxramas' expansion is now officially behind us. All of the expansion's new cards are now available and have already begun filling up player decks all around the world. Chatty is no different, having previously revealed some of the more notable combinations from the Arachnid Quarter and the Plague/Military Quarter. Now we're ready to wrap up with the Construct Quarter and the Frostwyrm Lair. And though Chatty is still going through their own list of favorite combos, they've discovered some cool combos to use. Some are more practical, while one in particular is just downright broken. Let's take a look. This one's a bit of a simpler one. Guybrushed found a potent control Warrior deck floating around on Reddit. 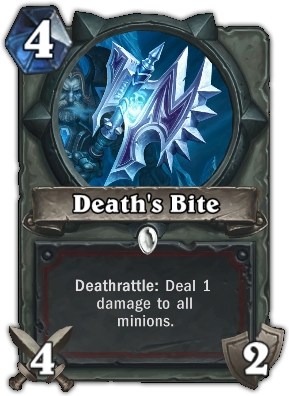 Its main draw is Death's Bite, one of the Warrior's cooler new toys. Death's Bite has the unique Deathrattle ability of hitting all minions for 1 damage, essentially turning it into a Whirlwind spell. And just like Whirlwind, the Warrior can take advantage of it to wipe out any lingering threats. However, for heavier hitters that are hanging around the board, the 1 damage is all the Warrior needs to use Execute and wipe it off the board. This is definitely an easy combo to use and one that Hearthstone novices should take full advantage of. Like Guybrushed, Chatty's Psigun has also been intensely researching new combos across various sites. One common theme he found was the use of Undertaker in Hunter decks. Undertaker is an extremely cheap 1 mana for 1/2 stats, which is already fine in itself. But cheap Deathrattle cards will quickly turn it into a monster. Beefing it up with Leper Gnome, Loot Hoarder, and Webspinner can up its stats quickly, with only a Silence spell that can stop it. One other Deathrattle minion that can help boost Undertaker is Mad Scientist, who has quickly made the Hunter's deck even more aggravating than it already was. 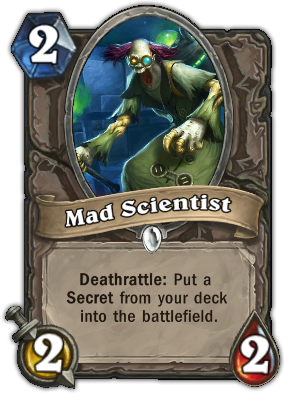 Since his effect will put a Secret in play, Mad Scientist can kamikaze himself for 2 damage and help Hunter play one of his many fury-inducing Secrets, like Explosive Trap, Snipe, and Misdirection. Mad Scientist was meant to help the Mage, but it's actually been the Hunter that's been its biggest beneficiary. Combine this card with Undertaker for a formidable duo. On paper, Zombie Chow seems utterly useless. Even at his low mana cost for higher stats, the Deathrattle effect of restoring 5 health to the opponent is hard to swallow. So leave it to handofthrawn to find a novel use for this undead minion. Since Auchenai Soulpriest turns all health-restoring effects into damage-inducing effects, its presence turns Zombie Chow into a time bomb. 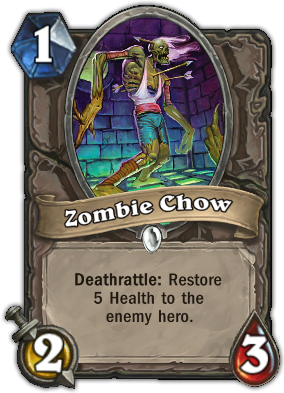 If the opponent doesn't deal with it right away, Zombie Chow can deliver an instant 5 damage directly to the opponent upon death. Chances are, savvy opponents can take one or both of these minions out on their next turn, which is why anyone utilizing this combo is also advised to have a Shadow World: Pain combo handy to sacrifice their Zombie Chow. Be forewarned, though! Do not use Circle of Healing unless you're absolute sure that Auchenai will survive. It's tempting to hit the entire board for 4 damage and pile the Zombie Chow effect on top. But if you aren't careful and deploy the spell with a +1 Spell Damage minion on the board, the Circle of Healing will take out Auchenai before the Zombie Chow effect can be applied. So you'll have wiped out your entire side of the board and still restored 5 health to your opponent. Don't be that person! Don't be like gnomish! Remember that Leeroy combo from a few weeks ago that summoned about 5 Leeroys at once? Believe it or not, that's not the most unfair combo to come out of Naxxramas. There's an even worse one out there and f4llen was the first to bring it to my attention. It takes Feugen and Stalagg both dying in the course of a game to summon the titanic Thaddius. The Shaman not only has the ability to call him, but he has the ability to call him more than once! You're asking yourself what just happened, aren't you? Let's explain this video. Stalagg fell earlier in the game, so this person summoned Feugen. Ancestral Spirit was used to give the Deathrattle effect that would resurrect Feugen at full health. For the next turn, Baron Rivendere was summoned to double all Deathrattle effects. This person then used Reincarnate to kill and resurrect Feugen immediately. Because of the double Deathrattle spells in place, Feugen was restored, as was a second Feugen because of the Baron, and a third Feugen because of the Ancestral Spirit spell. On top of that, since Stalagg died previously, this also summoned Thaddius, while the Baron's presence also summoned a second Thaddius! Believe it not, this still isn't the end of the combo. Because Baron Riverdere is still on the field, if any of the Feugens die, it will summon two more Thaddius's! It's literally an unbeatable combination and one that's actually not all that difficult to pull off. If you're looking for a quick way to win a game and aggravate your opponent at the same time, here's a great combo for you. With that, we've reached the end of our Naxxramas card combinations feature. Special thanks to our Chatty posters that helped put this together. If you have any potent card combos you'd like to submit, leave them in the comments below. Ozzie Mejia posted a new article, Hearthstone: Naxxramas - Chatty's best card combinations (Construct Quarter/Frostwyrm Lair). 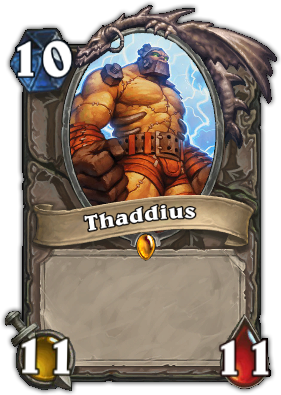 that thaddius combo is crazy.